Each year, the Florida Harbor Pilots Association identifies two minority cadets attending any of the six maritime colleges nationwide who show enthusiasm and aptitude for a possible career track as a harbor pilot within the State of Florida. Each recipient receives a $2,500 scholarship during the school year. 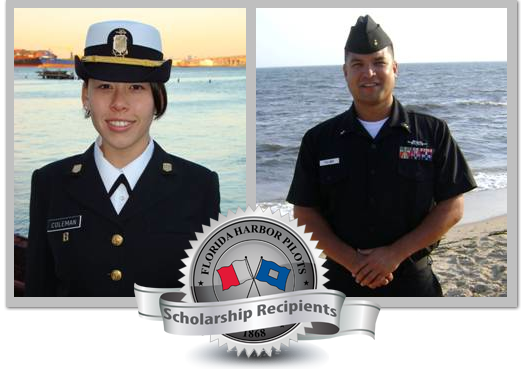 In addition to the $2,500 scholarship, each recipient receives $500 for travel expenses to attend a training session with a pilot association in Florida, where they have the opportunity to experience hands-on training and be exposed to all aspects of the harbor pilot career. To apply for a scholarship, please download the application. For more information on our association’s scholarship opportunities, please contact Gretchen Rayborn at ggfsu@aol.com or (850) 224-0219. The St. Johns Bar Pilot Association, in conjunction with the Propeller Club of Jacksonville, have provided for the establishment of the “Propeller Club of Jacksonville Scholarship in Transportation & Logistics,” at the University of North Florida in Jacksonville. This annual $1000 scholarship is available to University of North Florida students enrolled in the Coggin College of Business, who meet the required criteria. For more information and the full list of eligibility requirements, please contact: Lynn Brown, at lmbrown@unf.edu or (904) 620-1961.